​Maniquis-Smigel L, Reeves KD, Rosen JH, et al. Short term analgesic effects of 5% dextrose epidural injection for chronic low back pain. A randomized controlled trial. Anesth Pain Med. 2017;7(1):e42550. Maniguis-Smigel et al studied the analgesic effects of dextrose by injecting 5% dextrose (without any anesthetic) into the caudal epidural space of participants with chronic low back pain. The control injection was dextrose. Here is the abstract from that study. ​BACKGROUND: Hypertonic dextrose injection (prolotherapy) is reported to reduce pain including non-surgical chronic low back pain (CLBP), and subcutaneous injection of 5% dextrose is reported to reduce neurogenic pain, hyperalgesia and allodynia. The mechanism in both cases is unclear, though a direct effect of dextrose on neurogenic pain has been proposed. This study assessed the short-term analgesic effects of epidural 5% dextrose injection compared with saline for non-surgical CLBP. METHODS: Randomized double-blind (injector, participant) controlled trial. Adults with moderate-to-severe non-surgical low back pain with radiation to gluteal or leg areas for at least 6 months received a single epidurogram-confirmed epidural injection of 10 mL of 5% dextrose or 0.9% saline using a published vertical caudal injection technique. The primary outcome was change in a numerical rating scale (NRS, 0 - 10 points) pain score between baseline and 15 minutes; and 2, 4, and 48 hours and 2 weeks post-injection. The secondary outcome was percentage of participants achieving 50% or more pain improvement at 4 hours. RESULTS AND CONCLUSIONS: No baseline differences existed between groups; 35 participants (54 ± 10.7 years old; 11 female) with moderate-to-severe CLBP (6.7 ± 1.3 points) for 10.6 ± 10.5 years. 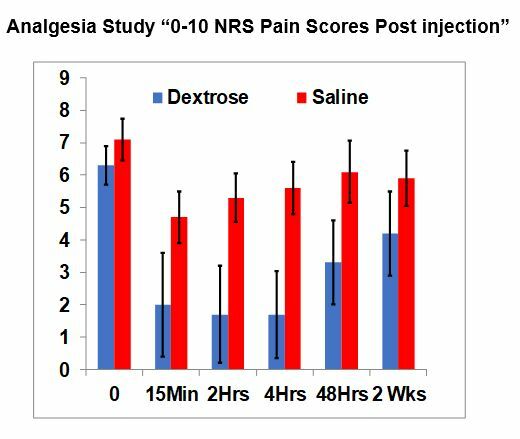 Dextrose participants reported greater NRS pain score change at 15 minutes (4.4 ± 1.7 vs 2.4 ± 2.8 points; P = 0.015), 2 hours (4.6 ± 1.9 vs 1.8 ± 2.8 points; P = 0.001), 4 hours (4.6 ± 2.0 vs 1.4 ± 2.3 points; P < 0.001), and 48 hours (3.0 ± 2.3 vs 1.0 ± 2.1 points; P = 0.012), but not at 2 weeks (2.1 ± 2.9 vs 1.2 ± 2.4 points; P = 0.217). Eighty four percent (16/19) of dextrose recipients and 19% (3/16) of saline recipients reported = 50% pain reduction at 4 hours (P < 0.001). These findings suggest a neurogenic effect of 5% dextrose on pain at the dorsal root level; waning pain control at 2 weeks suggests the need to assess the effect of serial dextrose epidural injections in a long-term study with robust outcome assessment. Added Comment: Note on the graph that are black lines for each bar. If the black lines for dextrose and saline do not overlap, it means the difference between the groups is statistically significant and is very unlikely to occur by chance. Objectives: Chronic low back pain (CLBP) participants in a prior controlled study reported short-term pain relief after caudal epidural injection of 5% dextrose (D5W). This study assessed whether repeated caudal epidural injections of D5W results in serial short-term diminution of CLBP and progressive long-term decrease in pain and disability. Subjects: Adults with chronic low back pain (CLBP) with radiation to gluteal or leg areas. Interventions: Caudal epidural injection of 10 ml of D5W (without anesthetic) every two weeks for four treatments and then as needed for one year. Outcome Measures: Numerical rating scale (NRS, pain, 0-10 points), Oswestry Disability Index (ODI, disability, %), and fraction of participants with ≥50% reduction in NRS score. Analysis by intention to treat. Results: Participants (n=32, 55±9.8 years old, 9 female) had moderate-to-severe CLBP (6.5±1.2 NRS points) for 11.1±10.8 years. They received 5.5±2.9 caudal D5W injections through 12 months of follow-up. The data capture rate for analysis was 94% at 12 months for NRS and ODI outcome measures, with 6% carried forward by intention to treat. A consistent pattern of analgesia was demonstrated after D5W injection. Compared with baseline status, NRS and ODI scores improved by 3.4±2.3 points (52%), and 18.2±16.4% (42%) respectively. The fraction of participants with 50% reduction in NRS-based pain was 21/32 (66%). Conclusion: Epidural D5W injection, in the absence of anesthetic, resulted in consistent post-injection analgesia and clinically significant improvement in pain and disability through 12 months for most participants. The consistent pattern post-injection analgesia suggests a potential sensorineural effect of dextrose on neurogenic pain. Comments: So what was the key finding related to analgesia when dextrose injections were given at 2 week intervals? The graph to the right shows the same pattern of analgesia after each injection of dexrose. This was in 32 participants with a variety of pain-causing diagnoses. A cumulative benefit was also seen, but that is not the focus of this section.